The unusually high spring tide is caused by Friday’s solar eclipse and the current ‘supermoon,’ which has seen the moon coming closer to Earth than usual. 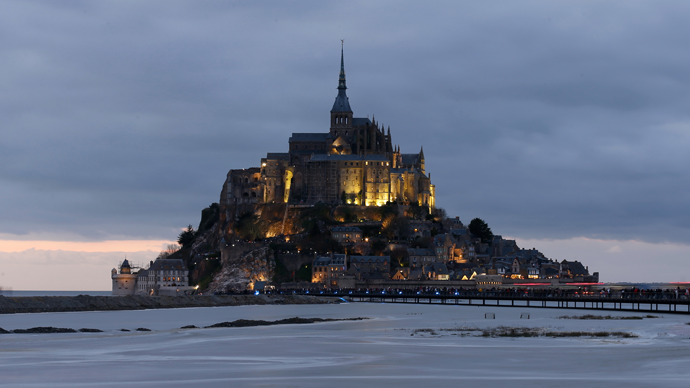 On Saturday morning, the tidal surge of around 14 meters – equal to the height of a four-story building – completely cut off Mont Saint-Michel from the mainland for a couple of minutes. The rocky Mont Saint-Michel, which used to be a medieval stronghold and is home to the historic Norman Benedictine Abbey, is known for having one of the world’s strongest tides. The French Naval Hydrographic and Oceanographic Service (SHOM) expected the tidal coefficient to reach a record-high of 119 on Saturday. The coefficient that ranges between 20 and 120 is based on the height difference between consecutive high and low tides. According to the Telegraph newspaper, around 20,000 watched and photographed the ‘tide of the century’ at Mont Saint-Michel. French Foreign Affairs Minister, Laurent Fabius, and Defense Minister, Jean-Yves Le Drian, were seen among the spectators. Thousands of people also gathered along the beaches in different parts of the northern France and south-west England. The ‘supertide’ will be experienced by other parts of the world as well, with a surge of up to 16 meters expected at the Bay of Fundy on Canada’s Atlantic coast. However, the ‘tide of the century’ description given to the phenomenon by the media is far from being accurate as the current positioning of celestial bodies repeats itself as often as every 18 years. So, the next abnormal tide is likely to occur sometime in March, 2033.